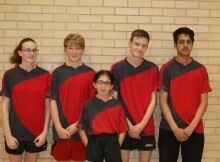 The final round of Junior Division 2C matches were played at the NETTS Table Tennis Club at the Recreation Club at Earls Colne where the first round of matches had been played some six weeks before. After that first round only two points separated the top four teams so there was all to play for when these teams played one another. 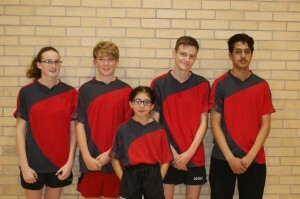 Cambridgeshire 2 played an ineligible player in the first round of matches but the corrections only affected Sets and Games of their team and their opponents and not the points of any of the Teams. 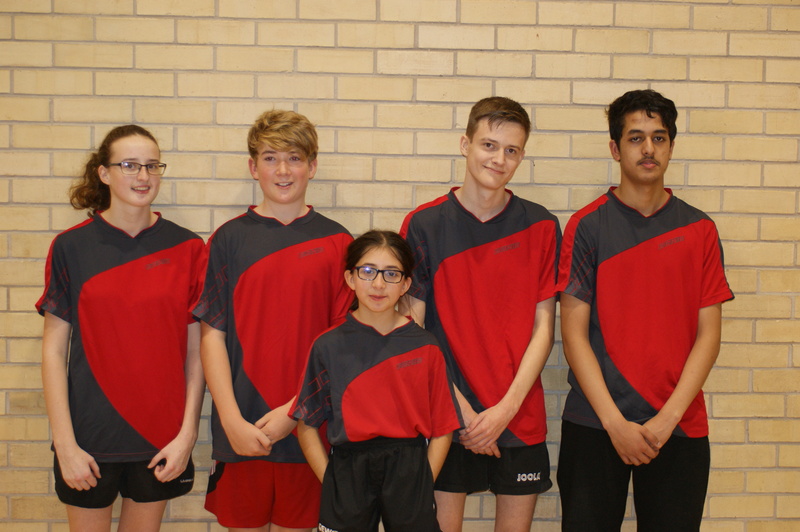 The Essex Team was the same team as that that played in the first round of matches on 21 October, namely Abdul Raqueeb (483), Matthew Stringer (411), Jared Chelski (214), Jaz Harvey (307) and Maliha Baig. As Jaz had to get to the Harlow Playhouse for a Dress Rehearsal Chloe Andrews would play in the last match. Figures in red brackets are the current Junior Rating points of the relevant players. In the first round of matches Essex played Herts who were one point ahead in third place in the Table. In the two opening matches Matthew lost to Finlay Cameron-Pryor (506) 3-1 whilst on the other table Jared lost to Jamie Watkin-Rees (546) 3-0. Jaz then played Ilyssa Lacorte (504) and after losing the first game 11-6 went on to win 3, 9, 11 and was extremely relieved to win that fourth game as that was the only match that the much higher ranked Ilyssa lost over the two days of play. On the other table Maliha was playing the highest ranked girl of any of the County teams, Charlotte Marsden (624) and understandably lost 3-0. Abdul lost 3-1 to the higher ranked Carl Breindel (687) whilst on the other table Jared was involved in a marathon match with Finlay. After winning the first two games 14 and 13 he lost the next two 8 and 6. In the decider he won the first six points only to lose the next seven. Resilience set in and five points later a great win was achieved. Jaz lost 3-0 to Charlotte while Maliha after going 2-1 up against Ilyssa finally lost 11-9 in the deciding game, a fine effort for a ten year old. Abdul beat Jamie 3-1, a good win, while Matthew lost 3-0 to Carl. With this defeat, 3-7, the Essex hopes of any honours were effectively over. The Essex team now had to play second placed Sussex 2 who could take over the lead of the Division depending upon the result of the Suffolk v Herts match. The Sussex team were determined to get back to Division 1 having been relegated last season and won the first four matches. Jared and Matthew both lost 3-0 easily to Kiego Burnham (405) and Billy Keegan (487) respectively. Maliha lost 3-1 to Joelle Bennett (262) while Jaz was involved with a marathon match with Jodie Morris (264), finally losing -9, -9, 9, 10, 11. Abdul finally achieved an Essex win, 3-1 over Owen Brown (513). Jared found Billy too much of a handful, losing 3-0 but Jaz beat Joelle in a very close match 10, 5, 9. Maliha had a five game match with Jodie losing 11-6 in the deciding game having been 2-1 up. Jared and Abdul lost the last two matches to enable the Sussex team to take over the top spot in the table after this 8-2 win and a Suffolk defeat. For the last round of matches Essex played Beds who were one place below Essex in the Table. Having not won a match all day Matthew employed Maliha as coach and two wins as a result, both 3-0 over George Whitley (243) and Ben Reddy (469). It came as a bit of a surprise for Abdul to lose to both Oliver Horswell (485) and Ben Reddy, both in the fifth game. Two wins each for both Chloe and Maliha over Maddie Whitley (70) and Gemma Russell and for Jared over Oliver and George gave the Essex Team an 8-2 win and fourth place. For Chloe a place in the Essex Hall of fame for junior players having a 100% record playing for an Essex Junior Team. For next season Chloe, Matthew and Abdul will no longer be Junior players. My thanks to John Jennings for umpiring all day and Tim, John and Tehmoor for coaching the players.